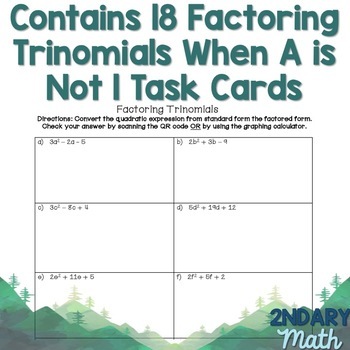 Factoring trinomials when A is not equal to 1. This file provides several options. 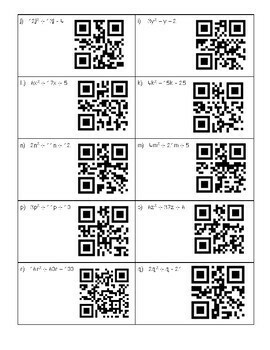 Print task cards with or without QR Codes. Option 1: If you want the QR Codes on the back of the task cards, print pages 1 & 3, 2 & 4 double-sided. This will print the blank task card on the front and the task card with the QR Code on the back. 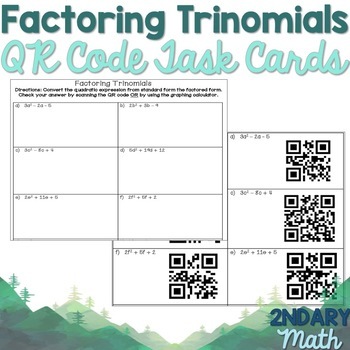 Note: QR Code task cards are in reserve order for easy double-sided printing. Option 2: Print pages 1 and 2 double-sided for students to show their work and write their answers. 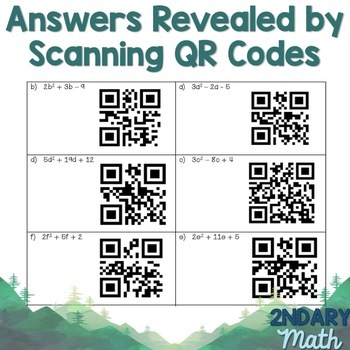 Then print pages 3 and 4 with the QR Codes on them, cut them out, and pass out once students have answered the question to check their answer.